Home Education Science Dark: Nyctophobia, Optophobia, Shadow, Umbra, Twilight, Dunning-Kruger Effect. What's The Speed Of Dark And Ignorance? Nyctophobia is the fear of the dark, it is an extreme fear of night or darkness that can cause intense symptoms of anxiety and depression but there's another fear that's more chilling it's the fear that darkness will go away. The fear of opening your eyes. Light travels at the fastest speed possible for a physical object, darkness is erased when light appears and returns when light leaves. The speed of dark is the speed of light but there are other types of darkness that can move faster than light speed for instance. Across a distance, a shadow can become much larger than the object creating it but still mimic its source moving in the same way for the same amount of time. So when a shadow is bigger than the object casting it. It moves a greater distance when the object moves but in the same amount of time. Make a shadow large enough and it can travel across the surface faster than light. If you here on earth, cast a shadow onto the moon, not an easy thing to do that pointing from. Say point A on the moon's surface and then you move your finger so that the shadow moved to point B. Your finger would only move a few centimeters in a fraction of a second but the shadow it cast on the moon would move thousands of kilometers in the same amount of time. Do it right and you were easily producing a shadow that breaks the light barrier. But nothing's wrong here. The rule is that information can't travel faster than light. You can't cause something to happen somewhere else faster than light could travel from you to that somewhere else. Our superluminal shadow is transferring no information from point A to point B. Sure, point B is being cast into darkness sooner than a Lightspeed message from A could warn him it's coming but darkness isn't traveling from point A to point B, it's traveling from you to point A and point B at the speed of light. What we tend to call a shadow? Shadow is really just a cross-section of a three-dimensional region. The darkness you are causing only changes to shape when newly unlocked light fills the previous gap. That's all a shadow is a gap. So, in a way, a shadow doesn't travel at all that's an illusion caused by us thinking that a shadow is a physical thing when in reality a shadow is just the lack of physical things. Photons- which chug along at the speed limit of the universe but that doesn't mean two shadows can't kiss or at least look what they are, as we bring two shadows near each other. Right before they actually make contact the shadows seem to magically bold toward one another in a sort of smooch of darkness. What's going on is the shadow blister effect and it has to do with the anatomy of a shadow. The region where an object completely blocks a light source is called the Umbra. It's the darkest part of a shadow and the most prototypical part of the shadow. Where only a portion of the light source is blocked we find the fainter penumbra. But as two or more penumbra's approach and overlap the combined amount of light they block can be enough to produce a perceivable difference, the shadow blister. The earth has a big umbra, it's 1.4 million kilometers long that's how far away you'd have to be from the earth for it to no longer have a large enough apparent diameter to block out all of the Sun. Here on the surface of Earth, we are nowhere near that far away which is why night is so umbral. The night is just the Earth's shadow falling on you, a you eclipse. Sunsets are cool, they're beautiful to look at but look the other way and you can see the lumbering shadow of our planet. Our atmosphere scatters shorter wavelengths of light more than longer wavelengths which makes the sky appear blue but in Earth's shadow there's less light to scatter and the sky appears darker. During Twilight you can see the demarcation. While driving east from Denver to Kansas City we get a particularly great view of it. This is Earth's approaching night making shadow the beautiful pink band above it that's the belt of Venus. It's caused by the sky reflecting the colors of the sunset behind us. You've probably noticed that right after the Sun sets and disappears from view there's still light in the sky scattered from the no longer visible Sun. This is what we call Twilight and there are many different stages of Twilight. If the Sun is less than 6 degrees below the horizon, it's technically Civil Twilight. You can still do plenty of stuff outdoors without the need for artificial lights. Down to 12 degrees below the horizon, we have Nautical Twilight. Artificial lights are more or less necessary but the sky still scatters enough light to be bright enough for ships at sea to navigate by seeing a contrast at the horizon between dark sea and faintly lit sky. Down to 18 degrees, an Astronomical Twilight is occurring. It looks like night but the sky can still get darker. Until Astronomical Twilight ends not all night time astronomical observations can be made. Below 18 degrees is technically, honestly night. If you live at greater than 48.5 degrees north or south latitude, during the summer the Sun never goes more than 18 degrees below the horizon it's never technically night. Places like London only reach astronomical Twilight at the most during these months. So if you live in one of these areas and you want to avoid doing something during the summer just tell people you'll do it tonight. You'll buy yourself a few weeks but that's slow darkness. Let's cut to the chase because we are looking for fast darkness. When scissor blades snip, the intersection point between both blades moves faster than the blades themselves. Think of it this way, if you had a pair of scissors with blades that were one light year long and it took one second to close them, the intersection point would have traveled an entire Lightyear in not a year but a second. No laws are being broken here because such a snip would be physically impossible. As mentioned before, rigid objects don't move instantaneously all over when a push force is applied to them. Instead, that force moves via electromagnetic forces from one atom to the next and so on down the line. A compression wave that travels at the speed of sound through the material but what if we ignored that problem by allowing the blades to simply be separately already in motion? Well, that a point of intersection can still travel faster than light because it's not a physical thing it's just a geometric point and it carries no more information than you could already gather by witnessing the approaching blades. But don't count out that geometric point of an intersection just yet. It's the key to another type of darkness that can move faster than light. 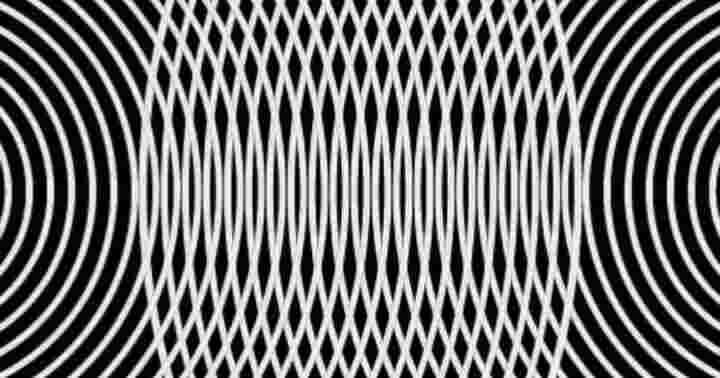 When waves collide their crests can fuse into larger crests, their troughs in the larger troughs, this is constructive interference. But crests colliding with troughs cancel out destructive interference if these waves are light the result is darkness and in certain circumstances darkness created this way can travel like the intersection between two lines faster than light. Imagine these concentric circles as waves of light, the lines are wave crests and the gaps in between are troughs. When they meet the points where they intersect flee up and down faster than the waves travel, especially in the middle which in the case of light waves makes them faster than light. The superluminal speeds of these dark patches can be seen really clearly if we make the wave crests of one source black as well as the background. 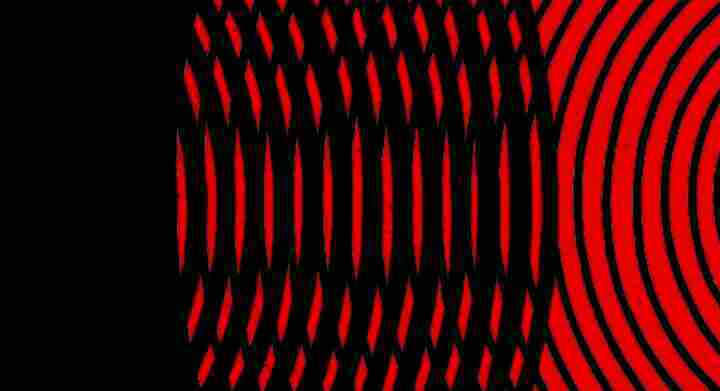 Overlapping regions where red peeks through represent destructive interference, darkness and you can see how especially in the middle this darkness raises up and down faster than the waves. In 1995, a man named McArthur Wheeler robbed a bank in Pittsburgh. He was caught because his only disguise was lemon juice. He covered his face with it. He knew that lemon juice could be used as an invisible ink when writing on paper revealed by heating and he knew so little about why that worked and he knew so little about how cameras work that he assumed with extreme confidence that lemon juice could make him invisible too. Seriously wheeler is an extreme example and was the inspiration for the Dunning-Kruger effect. Novices, people unskilled in particular disciplines will often overestimate their knowledge and abilities instead of discipline because they don't even know how they know how much more there is to learn. On the flip side experts in particular fields will often underestimate their knowledge have less confidence in their abilities or think that everyone else has the same level of knowledge that they do. What drives the Dunning-Kruger effect is that that could often the more you learn about something, the more you realize just how rich and complex and overwhelming and full of as-of-yet on answered questions it really is. George Bernard Shaw once famously toasted Albert Einstein by saying," Science is always wrong, it never solves a problem without creating ten more." Einstein didn't exactly disagree, he used geometry to illustrate how ignorance grows faster than knowledge saying, " As our circle of knowledge expands so does the circumference of darkness surrounding it. Learning, studying, shedding light on a field of inquiry also reveals just how in the dark we continue to be. How many shadowy things there are left for us to illuminate. The diameter of light never exceeds the shadowy circumference." But what's the speed of that kind of dark? The speed of the growth of the number of things we know we are in the dark about. What's the speed of ignorance? If we defined ignorance as the difference between questions we know to ask and answers we have, the field of Agnotology, the study of ignorance suggests that the amount of things we know we are in the dark about is growing faster than the number of things we have shed light on. Is it a coincidence that the phrase "in the dark" originated during of all ages the Age of Enlightenment? When Leeuwenhoek put a scraping from his under a collection of magnifying lenses he built, he saw for the first time in human history, little moving creatures microorganisms, he called them 'Animalcules'. The discovery shed light on why food spoiled life didn't spontaneously come from old meat, it was already there we just couldn't see it. But the discovery also showed us that we were in the dark about an entirely new realm of biology. As Philippe Bordeaux has poetically put it, "enlightenment leads to but benightedness science entails nescience." What's really cool about the expanding size of our nescient circumference is what Stuart Firestein, the chair of Biological Sciences at Columbia University has said about it, "it is there that science begins, where the facts run out, just beyond them." He says, "it is a mistake to Bob around in the circle of facts, instead of riding the wave to the great expanse lying outside the circle." If science is a road trip, facts are the photos we take along the way the fuel that drives it forward is ignorance. Facts more like fax, part of the past not the way forward. When it comes to understanding our world, no mean why is obsolesce by asking why. Knowing facts makes you bright but the equally quick, sometimes quicker and most rewarding prize is the dark and admitting that you don't know everything but that you'd like to know some of it.